Do you have hundreds of RSS Feeds in your feed reader and have trouble following them all? Help is on the way. AideRSS is an intelligent assistant that analyzes feeds and picks out the top feeds for you to read from blogs you care about. It categorizes posts as All Posts, Good Posts, Great Posts, Best Posts & Top 20. You can subscribe to any of these categories for a blog to filter out the rest. If you sign up for a free account, you could add the categories for the feeds you want to ‘My Feeds’ and then subscribe to just a single feed for Top Stories from the blogs you have added. PostRank is calculated relative to a blog. It doesn’t matter if a blog receives 5 comments in an average or 500 comments. PostRank for a post is determined by comparing posts to other posts within the blog. myFeeds shows Top Stories from blogs you have added as well as shows Blog Trends, a little graphic representative of hit posts. You can import an OPML file, which is a list of RSS feeds that most feed readers would let you export. They suggest waiting 24 hours to get all your feeds processed. Standard version will always be FREE and but there may be paid premium features in the future. aideRSS widget is available for blogs and expect to see one here on trial soon. As an avid RSS reader, I do have ‘groups’ of feeds in my GreatNews feed reader that I haven’t updated in months because I don’t have time to follow them anymore. Some of the topics include photography, personal finance, etc. Now, instead of just ignoring them all together I can atleast follow the top stories from them in my own custom feed from aideRSS. Although, I think a way to categorize the feeds you add to aideRSS would be nice or even the ability to tag the feeds and being able to subscribe to those tags would be awesome! For now, I might just create a separate account for each category and subscribe to those accounts. 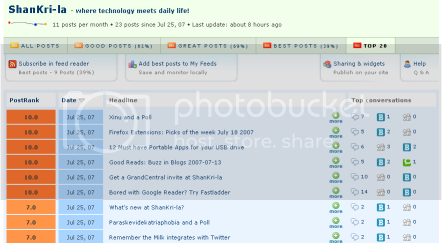 Here is a screenshot of Top 20 Posts from ShanKri-la. If only there was an easy way to filter out the stuff out of an OPML file without having to hand delete the ones I don’t want to import! I found the same problem when I was importing my bookmarks from del.icio.us to Mister Wong. Check out this part of their FAQ to help visualize how RSS might be useful depending on what your interest level is on a blog. This little diagram is illustrative of this concept. How do you address your RSS overload? What do you think are the pros and cons of aideRSS? It seems interesting enough. I wish you could categorize and tag them though. Yes, that will be a tremendous improvement and may be they are working on it as it seems like a feature any RSS user would ask for. Wow, this looks like a very nice service! It kind of reminds me of the River of News feature that many RSS readers have now, that displays them in order of importance based on these things, or based on your reading habits (Preferred feeds, etc.). @Kyle.. we don’t have this in GreatNews, do we? Or have I just not found it yet? I’ll give this service a go for a while and see how it helps my reading habit. Between, if anyone knows of a portable desktop RSS reader with River of News feature, let me know. I’d love to give it a shot.